‘Live Feed’ is a live performance in which I was sitting on a rocking chair with a fake baby in my arms and a VR headset covering my eyes. On the screen behind me, my avatar was ‘live’ inside a similar looking room in the virtual world of Second-Life. 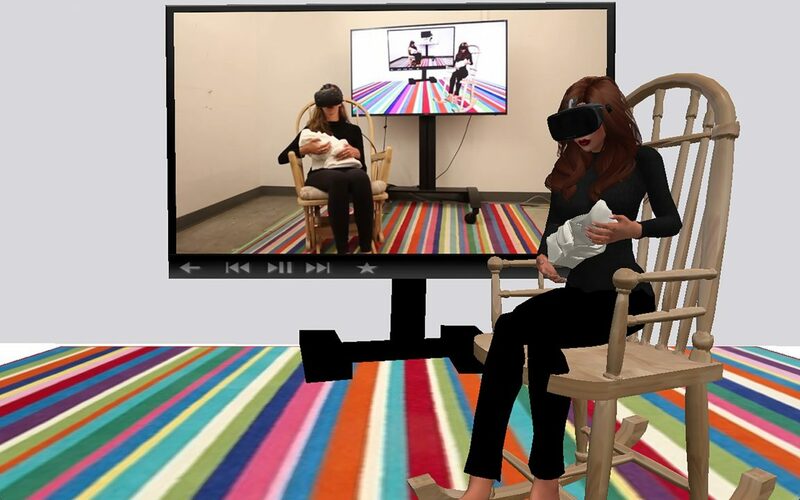 The avatar was sitted on a similar chair with a fake baby and a VR headset. On the screen behind her is another screen with an image of my real self. This goes on and on and on as one figure immersed in VR watching the world of the other. ‘Live Feed’ is intended to raise questions in regard to the medium of VR worlds and VR headsets which are being increasingly positioned as a household commodity. What does it mean to be a mother in the time of virtual reality? Moreover, what does it mean to be human in this age? What are our relationships to one another as people when we interact with each other through this technology? And which are the values that our children grow to learn in this environment? Avital Meshi is a new media artist, currently studying for her MFA at the UC Santa-Cruz program for New Media and Digital Art. Avital’s practice focuses on the way people connect with one another through avatars in games and virtual worlds. She asks questions in regard to our virtual experiences and their ability to influence our life in the physical reality.